NSL Photography Blog: Planning to photograph the Continental U.S.' first total solar eclipse in 38 years? Planning to photograph the Continental U.S.' first total solar eclipse in 38 years? As long as a year ago, many photographers made reservations to ensure they would be in the direct path of the totality of the upcoming total solar eclipse. It takes place next Monday, August 21. 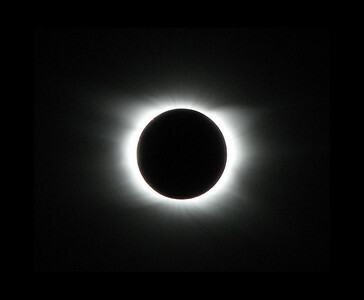 The last total solar eclipse seen in the Continental U.S. occurred in 1979. Fortunately for photographers the totality of the approaching total solar eclipse will be seen in parts of fourteen states, so there are plenty of places to setup one's gear to make full eclipse images. For those unsure of what it is, a total solar eclipse is when the disk of the moon completely blocks out the disk of the sun. This will be seen in a path across the U.S. from Oregon to South Carolina, about 70 miles wide, called the “path of totality.” Outside that “path,” those viewing the eclipse will only see a partial eclipse. The further away watchers are located from the “path,” the less sun will be hidden behind the moon. Where I live, a considerable distance from the “path,” we'll be able to see only a 75% partial eclipse. Southern Texas and northern Maine will have the least view of the eclipse in the Continental U.S., with only about a 50% coverage of the moon blocking the sun. Eclipse watchers should NEVER view a partial solar eclipse, including that which precedes and follows a total solar eclipse, with the naked eye. Looking directly at the sun, even when it is partially covered by the moon during a solar eclipse, can cause serious eye damage and blindness. While it's technically true that it's safe to look at the solar eclipse during the time of totality, when the moon totally covers the sun, for many it could be a terribly harmful mistake. The problem is the brevity of the eclipse's totality. While along the “path's” dead-center, totality lasts somewhat over 2 minutes, at the “path's” edge it lasts for the “blink of an eye.” If your eyes aren't protected while viewing the eclipse when the totality ends, you risk serious eye damage and blindness. To view the solar eclipse directly, you should wear special solar eclipse protective eyewear. I strongly suggest you wear certified (CE or ISO 12312-2 (also written as ISO 12312-2:2015)) eclipse viewing glasses sold across the country by reputable companies. Lunt Solar Systems Solar/Solar Eclipse Viewing Glasses are certified, for example, and inexpensive at about $13 for a pack of five. Even with protective eyewear, you shouldn't look at the partial solar eclipse for more than three minutes at a time. If you look intermittently, you can watch the entire progression of the eclipse in your area. If you have an eye disease or recent eye surgery, don't view the eclipse at all, even with protective eyewear. Even the strongest sun glasses, including the extra dark ones given to cataract patients to wear after surgery, don't provide enough protection to view an eclipse, even for a moment. If you don't have a pair of certified solar eclipse eyewear, don't view the eclipse. If you plan to photograph the eclipse, regardless of where in the U.S. you'll shoot from, you'll need a special solar filter for your camera. Many photographers use neutral density filters regularly to reduce the light coming into their camera/lens without affecting the colors of the image. Standard neutral density filters, even stacked, will typically block about 10–12 f/stops at most. That's not nearly strong enough to photograph a solar eclipse. Solar filters are typically at least 18–20 f/stops in strength, about twice as powerful as the strongest neutral density filters. They are essential to protect your camera equipment. Without one of these filters on the outer end of your lens, the light of a partial eclipse can burn out your camera's main digital sensor, autofocus sensors, and other light sensitive parts. To obtain the most detail in your images, use a lens with a focal length (or equivalent) of at least 200mm, but 500mm is better. If your camera has both an optical and digital zoom, only use the optical zoom for the eclipse. Use a tripod to hold your camera steady. This is especially needed if you're using a long focal length lens. If you have access to a remote shutter release, use it to eliminate camera movement from pressing the shutter release button. Set your focus manually to infinity. The sun is about 93 million miles away. Use a fast shutter speed to freeze the motion of the moon as it travels across the sun. I suggest starting at 1/125 of a second. Faster shutter speeds won't typically improve your images very much. Use an aperture of about f/8 to f/11. That way you can avoid diffraction and chromatic aberration to the extent possible, but keep the images sharp. During the partial eclipse, use a ISO setting to get the right exposure for you image as you've already set your shutter speed and aperture. Take test shots until you reel it in for your location. When you get to about a 90% partial eclipse you'll find your exposure will begin to change rapidly. Start bracketing your photos and use you LCD to review your images regularly to get to the right exposure settings. Use as many shots and stops in your bracketing as possible. In the totality of the eclipse, take the solar filter off or you'll miss the corona. Start with an ISO of 400. I'd set my aperture to f/11. Bracket your shutter speed from about 1/1000 of a second to a half second. Adjust as needed. Whether you're in the eclipse's “path of totality” next Monday or you're somewhere else in the U.S. to view it as a partial solar eclipse, be safe. Even photographers need to wear certified protective eyewear as well as protect their camera too. That way your photographs will look good and your camera will still work after the eclipse is over. Great article. Now I have a starting point to shoot the eclipse. I've been reading many articles but this finally talks about where I can start to get my exposure settings. Thanks to your advice I'm not going to kill my camera. My solar filter arrived Saturday. I'm all set. Thanks. I'm in the states from Rome and having a great time. Do I really need the solar filter? I've taken many photos with the sun in the background and a large sun at sunset. I know it's last minute but please advise. Yes, you really need a solar filter to shoot the partial eclipse portion of the eclipse. When it's in totality, not only don't you need the filter, you don't want it on, but when the partial eclipse starts at the end of totality, get the filter on fast before aiming the camera at the sun and shooting it. The problem is that if you have the sun in the background of a shot on a normal day, or at sunset, it's either indirect light enough, small enough, or filtered by the atmosphere enough when low to the ground that it's power coming into your camera is highly diminished. On the other hand, during the eclipse when you point the camera directly at the sun for a lengthy period and the sun is a substantial part of the frame, its power will burn the sensor and AF sensors out. And don't forget that your eyes need to be protected by certified eclipse eyewear. It's especially important as the eclipse comes out of totality when your eyes are highly susceptible because they'll be dilated from viewing the eclipse totality. If you don't have a solar filter to use, you can shoot the totality if you location gives you enough time to line it up and shoot, but otherwise leave your camera at home or if traveling to see it, in your hotel. If you don't have the right eyewear, likewise, except in totality don't look at the eclipse at all, and look away before totality ends. Don't ruin your camera or your vision!!! Thanks Ned. I guess I'll have to skip shooting the eclipse. I didn't get a solar filter and I'm outside the band where you get totality by about 100 miles. I do have the eyewear. Got my solar filter and ready to go this afternoon in South Carolina.